Die Rysanek als Brünnhilde? Das war zunächst nur ein Gerücht. Wer sich schließlich den sündhaft teuren Bildband über die Sängerin leisten konnte, der 1990 bei Hoffmann und Campe herausgekommen war, wusste es aber bald genau: Eher beiläufig war dort in der Diskographie eine Schallplatte mit den Tonaufnahmen aus dem (auch im deutschen Fernsehen gezeigten) Film Frauen um Richard Wagner nach dem Roman Magic Fire von Bertita Harding aufgeführt. Das Label? STV. Das klang nach limitierter Privat-Club-Pressung. Und so ist es auch! Inzwischen wurde die LP bei eben dieser Club-Firma auf CD umgeschnitten und wiederum in einer Edition von tausend Exemplaren auf den Markt gebracht. Nicht nur das. Das Label Filmjuwelen zog dann mit dem Film gleich nach – nun mit dem Titel Magic Fire – Die Richard Wagner Story. Alles Warten hat sich gelohnt. Die Rysanek als Brünnhilde ist jedoch leicht übertrieben. Da gibt es einen kleinen Ausschnitt aus dem Schlussgesang der Götterdämmerung, die letzten zehn Zeilen von „Fühl‘ meine Brust auch“. Lohnt sich das? Es lohnt sich! Aufgenommen wurde 1955. Die Rysanek begann gerade ihre große internationale Karriere, in der die Brünnhilde aber nicht vorkommen sollte. Was damals leicht, leuchtend und sehr vielversprechend klang, war abgetrotzt. Ganz sicher wäre diese Sängerin nicht so lange im Geschäft geblieben, hätte sie eine hochdramatische Richtung eingeschlagen. Am Ende ist so eine kurze Sequenz vielleicht doch mehr wert als hundert Mitschnitte als Brünnhilde, wäre es denn dazu gekommen. Die Fans können sich verzehren. Ach, hätte sie doch… Sie hat nicht und das war sehr klug. Im krachbunten Film ist die Musik einem Schnelldurchlauf der ersten geschlossenen Aufführung des Ring des Nibelungen 1976 in Bayreuth untergelegt. Mit echtem Pferd Grane, reitenden Walküren und der finalen Katastrophe, bei der die Balken der Gibichungenhalle in den Flammen des Weltenbrandes zusammenkrachen. So dürfte das vorher und nachher nie auf einer Bühne zu sehen gewesen sein. Musikalisch ist das Potpourri nur machbar, weil Erich Wolfgang Korngold das Original den filmischen Erfordernissen angepasst hat. Das klingt flott, irgendwie anders, und ist doch immer Wagner. Korngold hat Respekt vor dessen Musik, jubelt nichts Eigenes unter. Sein Werk ist das Arrangement. Davon versteht er sehr viel. Einige fremde Zutaten beziehen ihre Verwendung aus der Handlung des Films. Als Wagner das erste Mal nach Paris kommt, mischt sich die Marseillaise unter den Fliegenden Holländer, den er noch als Idee in der Tasche hatte. Bei der zum königlichen Lever aufgebauschten ersten Begegnung des armen Schluckers aus Deutschland mit dem gefeierter Giacomo Meyerbeer, den Wagner als scharfen Widersacher empfand, umschmeichelt Musik aus den Hugenotten das Ohr. Biographisch folgt der Film zwar den wichtigsten Ereignissen im Leben Richard Wagners, die Einzelheiten sind oft ziemlich frei gestaltet und streifen den Kitsch. So wurde das „Siegfried-Idyll“ ja nicht etwa kurz nach der Geburt des Stammhalters in Triebschen aufgeführt, sondern erst ein Jahr später in Erinnerung an das freudige Ereignis. Dar Tod in Venedig ereilt Wagner bekanntlich auch ganz anders als im Film, wo er im Beisein von Frau Cosima und Franz List am Flügel Parsifal spielend mit verklärtem Blick gen Himmel fast unmerklich den Geist aufgibt. In Hollywood werden halt Lebensläufe nach eigenen Gesetzen in Szene gesetzt. Wer sich auf den Film einlässt, weiß das. Die Hauptrolle spielt ohnehin die Musik. Die Rysanek muss auch noch die Senta und die Sieglinde geben, Partien, die sie tatsächlich im Repertoire hatte. Neben ihr wirkt noch der junge Hans Hopf episodisch als Tannhäuser, Siegmund und Walter von Stolzing, während Otto Edelmann für Holländer, Hans Sachs und Wotan zuständig ist. Produzent des Albums ist übrigens George Korngold, der 1928 geborene Sohn des Komponisten, der jetzt selbst zu Wort kommen soll. Den nachfolgenden Artikel im originalen Englisch entnahmen wir dem Booklet zur oben genannten CD, daraus auch das Schwarz-Weiß-Foto. Die Farbfotos stammen aus dem Film. „The Lord of the Ring – In early 1954 William Dieterle, the respected film director and an old family friend, approached my father, Erich Wolfgang Korngold, with the idea of supervising and adapting the music of Richard Wagner for his production of Magic Fire, the biography of Wagner’s life, to be shot entirely on location in Germany It had long been Dieterle’s dream to bring Wagner’s life to the screen and Republic Pictures had decided to finance the film from monies frozen in German banks after World War II, monies they could not otherwise transfer to the U.S. Famous for his film-biographies, Dr. Ehlrich’s Magic Bullet, The Life of Emil Zola and Juarez (the latter with music by my father), all highly distinguished and acclaimed motion pictures, Dieterle was the logical choice to attempt dramatization of the life and career of the great German composer. The screenplay was written by Bertita Harding, based on her book Magic Fire in collaboration with Dieterle (he wrote under the pseudonym of David Chantler) and E.A. Dupont, the renowned German film director. The scenario was long, wordy and Germanic, and tried to cover too much of Wagner’s life, but it was factual and left room to present a large „sampling“ of Wagner’s music without interruption by dialogue or action. My father had retired from films in 1947 to return to composition for the concert and opera stages and had refused many offers to compose music for motion pictures. 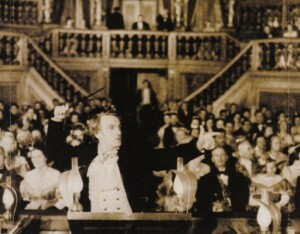 After first turning Dieterle down, he finally decided to take on the difficult task of adapting Wagner’s music because he was afraid that in less devoted hands the composer’s music would suffer the same fate as had that of many other great musicians whose lives had been brought to the screen by Hollywood. Republic, known for its productions of low-budget „westerns,“ was not exactly the ideal choice to undertake such a serious project, but they had indeed previously ventured into the field of respectable, prestige films (The Quiet Man) and Dieterle felt he could make the film under their aegis, provided he was allowed a free hand as promised. The conditions for my father’s participation were ideal. He would be free to choose repertoire, artists, orchestra, chorus and the recording venue, and his wishes in music/dramatic matters were to be adhered to without any interference. Then and only then did he accept the offer. 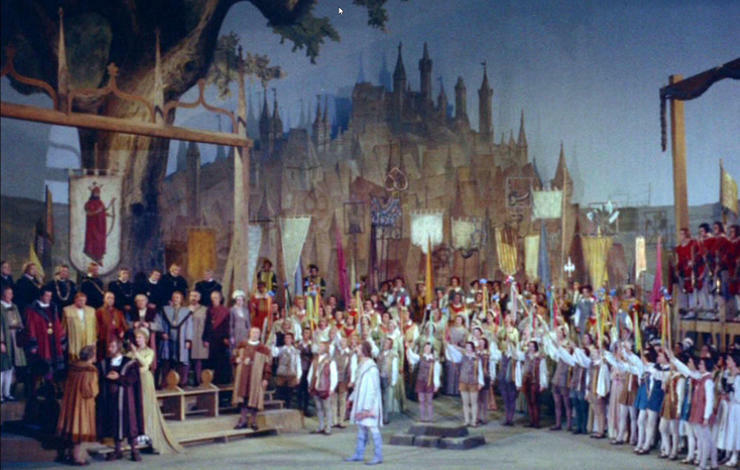 This had not been a very auspicious beginning, but nevertheless things began to improve immediately, with Dieterle pushing ever forward with the complicated shooting schedule, which included such locations as the delicately imposing Mark Grafliche Theatre in Bayreuth (Der Fliegende Hollander sequence), the Wagner Festspielhaus in Bayreuth (Der Ring des Nibelungen montage), and the Bavarian State Opera in the Prinz Regenten Theatre in Munich (Die Meistersinger excerpts). While shooting in the Bayreuth Festspielhaus it was discovered that the actor who was to portray the conductor, Hans Richter, had not shown up on the set and Dieterle appealed to my father to take his place so that the filming of the difficult Ring sequences could commence. Dressed in tails and made up with a beard and wig, my father thus made his second cinematic appearance „conducting“ the Ring! 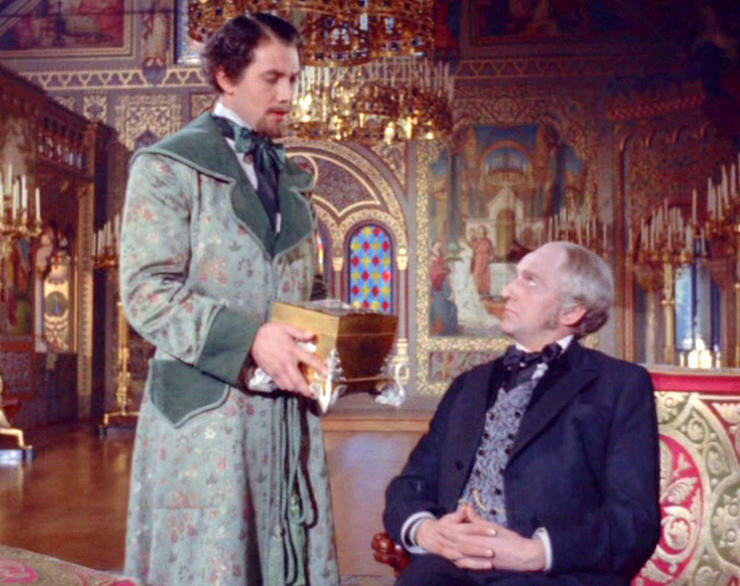 (He had previously appeared playing the piano in a short film about the making of A Midsummer Night’s Dream in 1934). the music is the socalled „foreign track,“ a recording made without dialogue to be sent to foreign countries so that they can „dub“ in their respective languages. 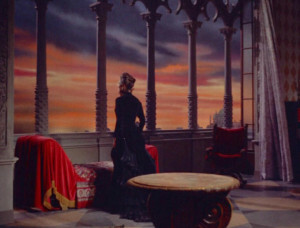 Thus, many pieces either end abruptly, reflect some „perspective“ effect, or are faded at the end to accommodate changing visual scenes and deletions from the original version. As was his custom, my father played all the solo piano parts, as he had done in all his previous films where called for. Due to ill health, he was not allowed to conduct the music and Alois Melichar, a name undoubtedly familiar to collectors of early Deutsche Grammophon records, where he was a respected chief conductor, was asked to conduct. Their collaboration led to a lasting friendship and Melichar later went on to conduct the first broadcast performance of Korngold’s Symphony in F in Graz, Austria. 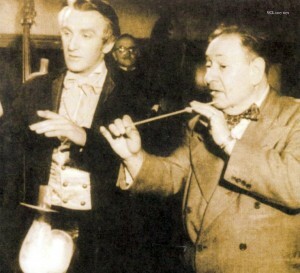 Throughout the filming of Magic Fire, my father began to see more and more of his „dreams“ fading. And when we watched the first screening of the rough-cut film, he turned to me with a twinkle in his eye and whispered: „… perhaps Dieterle should have signed his contract at 6:30 in the morning!“ Later, as the film was being shortened more and more, he nevertheless kept his undaunted good humor and once remarked that „… when I had to compress 16 hours of the Ring into five minutes, that was already drastic, but now that they have cut it down to four minutes – that’s too much…“ In the end, Magic Fire, already damaged by a weak script and a not all too awe-inspiring cast, could not survive. Unfortunately, despite a heroic performance by Alan Badel as Wagner, the beautiful camera work of Ernest Haller (Gone with the Wind) and the grand music of Wagner, it was not strong enough to withstand the tamperings of Hollywood executives. It was releasedor, as one of the members of the staff quipped, it „escaped“ – in late 1955 and quickly disappeared, to surface years later on late-night television. 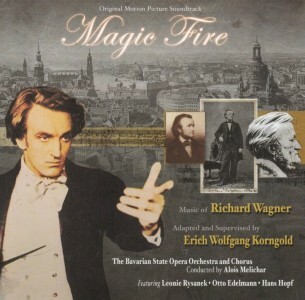 Magic Fire – Die Richard Wagner Story. 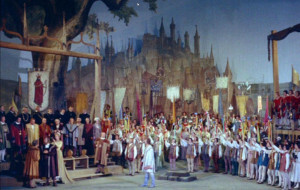 USA 1955, Regie: William Dieterle, 103 Minuten, Mitwirkende: Alan Badel (Richard Wagner), Yvonne de Carlo (Minna), Carlos Tompson (Franz Liszt), Rita Gam (Cosima), Gerhard Riedmann (Ludwig II.) und viele andere. Label: Fernsehjuwelen, Bestellnummer 6414361. Giuseppe Verdi – Eine italienische Legende, Ko-Produktion zwischen Italien, Frankreich, Deutschland, England, Schweden und der Sowjetunion 1982, 529 Minuten in acht Teilen, Regie: Renato Castellani. 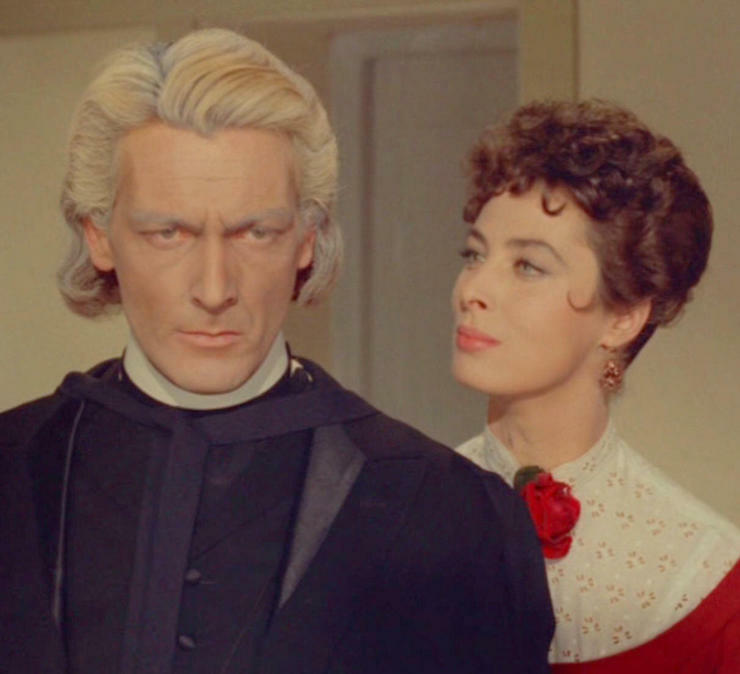 Mitwirkende: Ronald Pickup (Giuseppe Verdi), Carla Fracci (Giuseppina Strepponi), Giampiero Albertini (Antonio Berezzi), Lino Capolicchio (Arrigo Boito), Eva Christian (Teresa Stolz), Daria Nicolodi (Margherita Barezzi), Jan Niklas (Angelo Mariani), Nino Dal Fabbro (Giulio Ricordi) und viele andere. Label: Fernsehjuwelen, Bestellnummer: 6414274.